We’re are at your service to help you discover the wardrobe that complements your lifestyle at the Chicago St. John boutique. Whether it’s for an evening gala or updating your workwear, our stylists are there to provide you with the unforgettable shopping experience you’d expect from St. John. While visiting us, make sure to ask about our other client services including alterations, in-home delivery and one-on-one fit and style consultation. For more information please call us at 312-943-1941. 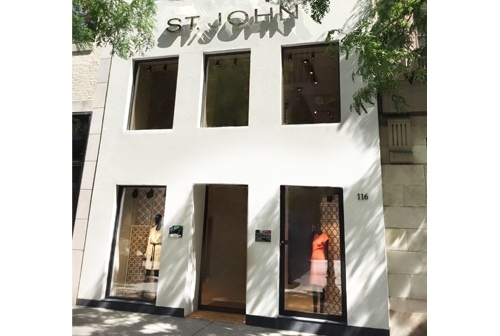 The St. John Chicago boutique offers the latest in women’s ready-to-wear fashion for everything from embellished evening gowns to relaxed vacation pieces. Located at 116 East Oak St. near the beautiful Gold Coast neighborhood, the boutique in Chicago is one of the premier shopping destinations near downtown and just steps from Michigan Avenue. Three welcoming floors feature French parquet wood floors and a VIP space where wardrobe specialists give one on one styling. As soon as you step into St. John Chicago, you’ll experience all the luxury that has become synonymous with the name. Our personal service and attention to detail has helped set the standard and is matched only by our hand crafted collections including our iconic knit jackets and dresses. We practice craft and couture. With iconic American design as our heritage, we invite you to experience first-hand, the meticulous details, luxury craftsmanship, and one of a kind embellishments that have become synonymous with St. John Knits. Visit us at the St. John Knits Chicago boutique and we will personally guide you through the range of St. John collections to see the effortless, alluring and refined clothing that has appealed to women all over the world since 1962.